Among people everywhere there is increasing concern about the quality and safety of our food as well as concern about harm to the environment from ill-conceived agricultural activity. Tilth's mission is to promote environmentally sound and sustainable agriculture. We are devoted to learning about and promoting ways in which to raise food, ornamentals, other farm crops and farm animals without damage to the environment. South Whidbey Tilth is seeking an apprentice interested in sustainable food growing, land resource conservation practices and farmers market and farm stand management. See the full job description here. Join us Sunday, April 14 at 11 a.m. to tidy up the Farmers' Market grounds before the April 28 opening. Bring work gloves, rubber gloves, weeding tools, pruners, brooms, rags and more if you have them. Treats to share are also welcome and there will be hot tea and coffee available. Come to the market site on 2812 Thompson Road, Langley on SR 525 between Freeland and Bayview. The Farmer’s Shadow is a monthly drop-in educational event sponsored by South Whidbey Tilth and Slow Food Whidbey Island. Led by South Whidbey farmer Anza Muenchow, meetings start with a short presentation on a chosen topic. There is plenty of time for questions and open discussion. These are key questions for every new gardener as well as those who are more experienced. Learn about the most reliable crops and seeds for our area. And maybe try something new this year. Besides our climate and projected climate variations this year, there are microclimates that help our different crops. Consider joining a community garden where you can share produce and growing tips from the other gardeners. Come to this inspiring class and get ready for a great season. Meetings are held on the First Tuesday of every month from 6 to 7:30 p.m. at the Bayview Sears House, 2812 E Meinhold Road, Langley. Meetings are drop-in, no need to preregister. We ask for a donation of $5 to $10 to benefit South Whidbey Tilth and Slow Food Whidbey Island. For more information contact Anza, education chair. Congratulations to recently elected members of the governing council of trustees: Lynae Slinden, Edward Hueneke, Leah Claire, Andréa Linton and Anza Muenchow. Trusees continuing the second year of their terms are Prescot, president; Kirstin Clauson and Ida Gianopulos. The next regular business meeting is Thursday, April 18 at 6 p.m. in the Trinity Lutheran Church Annex in the Nursery. Members are welcome to attend and participate. Questions? Contact the President for information or leave a message at 360-321-0757. Find us on ...and like us! Please look for both South Whidbey Tilth and South Whidbey Tilth Farmers' Market. South Whidbey Tilth depends on its volunteers. Please download a volunteer form as a pdf file. Keep track of your time all year. Mail to South Whidbey Tilth or email to the Treasurer. The South Whidbey Tilth 11-acre Sustainability Campus provides a unique, leisurely ambience and focus for learning. The campus is open for walking, and you can view our ongoing projects: demonstration field crops, community garden and orchard, forest trail and understory recovery project, native plant salvage beds operated by Native Plant Stewards, the highway vegetation management model, and bluebird nesting boxes established by Coupeville fifth-graders. Dog walkers, please usethe poop bags behind the restroom where the directional signs are. Use the trash can there. South Whidbey Tilth has opportunities for you to help with classes, farmers' market, community gardens, facilities maintenance and improvements and forest restoration projects. On August 27, 1977, more than 70 people gathered at Pragtree Farm near Arlington, WA, to develop strategies for the sustainable agriculture movement in the Pacific Northwest. Known as the "Regional Planning Meeting," the gathering established the framework for the Tilth Association. Recently the Berry Center in Kentucky posted a video of Wendell Berry's July 1, 1974 speech in Spokane. Wendell's insights are as powerful today as they were forty years ago. The full transcript of his speech is available on the Tilth Producers website. 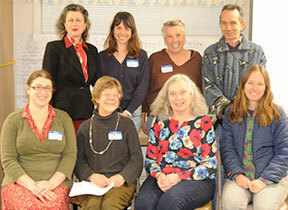 The meeting at Pragtree Farm laid the foundation for organizing local Tilth chapters. The next spring the first chapters were formed in Seattle and in Southwest Washington, followed by Willamette Valley Tilth and Rogue Tilth in Oregon. By the summer of 1982 there were 15 Tilth chapters in California, Idaho, Oregon, and Washington, with an estimated combined membership of 2,000. At the Regional Planning Meeting three years later Anthony Judge's ideas were incorporated into Tilth's strategy of organizing autonomous local chapters empowered to respond to the needs of their communities. Over the past three decades the Tilth movement has ebbed and flowed, with the central organization dissolving into statewide organizations in Oregon and Washington, and local chapters forming and fading away. Because of its decentralized, ecological strategy, however, Tilth has continued to adapt, survive, and thrive. Today Tilth is experiencing a resurgence parallel to the growth of the organic food and farming nationwide. The complete story by one of the founders, Mark Musick is on the Washington Tilth website select History. All the Tilth organizations celebrated the 40th anniversary at the Tilth Producers Conference in November 2014. Mary Berry, Wendell’s daughter, was a keynote speaker.